In March 2007, Takaya Tours entered into a co-management agreement with Deep Cove Kayak Centre to run the Cates Park operations and since then we have been growing our business and offering into what it is today. The ancestral name for this land is Whey-Ah-Whichen which means ‘faces the wind’. Cates Park has great importance to the Tsleil-Waututh people. It was used as a small village during the spring and summer months to hunt and gather the natural resources such as wild game, berries, flora and fauna. 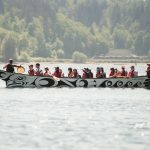 Today the Tsleil-Waututh people use the park for cultural events, ceremonies and to run one part of the Takaya Tours kayak operations. Pronounced “slay-wah-tuth”. The People of the Inlet, a Coast Salish people with their own distinct customs and history. Their language is Downriver Halkomelem. 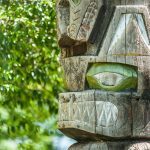 They are a small and growing community of 500 with a traditional territory stretching from the Fraser River in the south to Mamquam Lake east of Whistler Mountain in the north. The community is located on the Burrard Inlet between North Vancouver and Deep Cove, BC. The Tleil-Waututh have travelled the land and waters of their traditional territory for thousands of years, and wish to share knowledge with visitors who appreciate wild nature and authentic indigenous culture.